Academic Staff Union of University, ASUU, of Ladoke Akintola University of Technology, LAUTECH has directed its members to begin a two-week warning strike over alleged poor funding of the institution by the two owner state governments of Oyo and Osun. 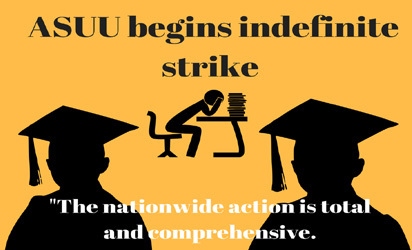 ASUU strike In a statement, yesterday, jointly signed by its Chairman and Secretary, Biodun Olaniran and Toyin Abegunrin respectively, the union stated that the strike was to give more opportunity to the owner states to prevent total shutdown of the institution. The institution had gone on a lengthy strike which paralysed academic activities in the institution for several months. According to the union, despite the Memorandum of Action, MoA, signed with the management of the school, the governments of the two states are yet to fulfill their own part of the agreement. “The council also promised to work out the modality of paying salary arrears, promotion arrears, earned academic allowances (EAA) as well as paying monthly salaries as at when due. Out of eleven months salary arrears, only one month had been paid. “The payment of monthly salary had become dwindling since May and nothing had been paid on promotion arrears and EAA. The union observed the failure of the council and the university administration.